FAQs About Bravelle - Is there a reimbursement lawsuit? For couples seeking treatment for fertility problems, the process can be both emotionally and financially taxing. It is often necessary to undergo multiple rounds of treatment using several different medications and fertility technologies, adding up to thousands of dollars in out-of-pocket costs. When one popular brand of fertility drugs was recalled from the market in late 2015, it sent a shudder down the backs of couples who used it during their own fertility treatments. Essentially, their treatments were rendered ineffective because of this drug. Learn more about the fertility drug Bravelle, how it works and why it was recalled. What is Bravelle and what was it used for? Bravelle was a fertility drug used to help women with certain fertility problems get pregnant. It was used to stimulate the release of an egg from a woman’s ovary (ovulation), and could stimulate the release of multiple eggs for women undergoing fertility treatments such as in vitro fertilization (IVF) and artificial insemination (intrauterine insemination, or IUI). Bravelle contained follicle-stimulating hormone, or FSH, a naturally occurring hormone secreted by the pituitary glands in both men and women. In women, FSH helps stimulate the development and maturity of eggs (follicles). The pituitary gland ramps up production of FSH when women reach menopause in an attempt to release the last remaining eggs from the ovaries. Menopausal women have high levels of FSH in their urine, which researchers used to create the first fertility drugs. Interestingly, the first batches of FSH used in fertility drugs were extracted from the urine of menopausal Italian nuns. Some FSH-containing fertility drugs are still made from human urine, though the urine is purified to remove various proteins and other substances. Bravelle was made using this purified urine. How did Bravelle work and how was it used? Bravelle’s main ingredient, urofollitropin, was a purified form of FSH, a naturally occurring hormone belonging to the gonadotropin family. Gonadotropins are hormones released by the pituitary gland and play a central role in growth, sexual development and reproductive functions in both men and women. FSH stimulates the growth and development of eggs in a woman’s ovaries. Women with certain fertility problems, including those with low levels of FSH, may benefit from these types of fertility drugs. In most cases, Bravelle only stimulated the growth and maturation of eggs, it did not induce ovulation. The hormone hCG was often given once the eggs had matured sufficiently to stimulate the release of those eggs. Bravelle, like most gonadotropin medications, was available only as an injectable liquid medication. It could be injected just under the skin or into a muscle. Gonadotropin fertility drugs have relatively high levels of success compared to other types of fertility treatments. One study published in the New England Journal of Medicine in 2015 found gonadotropin treatments resulted in the highest number of births (32%) compared to other fertility medications, including Clomid, the first-line of fertility treatment for most women seeking help for infertility. Treatment with gonadotropins resulted in more multiple births than other fertility drugs during the study. According to babycenter.com, women who get pregnant after using gonadotropins have a 30% chance of conceiving twins or more. Who made Bravelle and when was it approved? Bravelle was manufactured by Ferring Pharmaceuticals, a privately held biopharmaceutical company headquartered in Switzerland. Ferring operates in numerous countries and employs about 5,000 people worldwide. 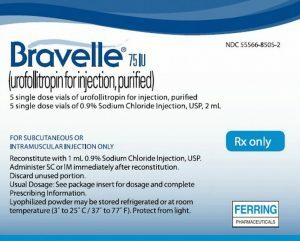 The Food and Drug Administration approved Bravelle for use in the United States in 2002. What were the possible side effects of Bravelle? Women taking Bravelle were at a higher risk of developing OHSS, a serious condition that can occur when too many eggs are stimulated in the ovaries and estrogen levels become too high. OHSS is characterized by enlarged and painful ovaries and can be serious if not treated early. Bravelle users were at an increased risk of ovarian torsion, which occurs when one or both ovaries becomes twisted. When ovarian torsion occurs, the ovary may not get enough blood supply. If blood supply is cut off to the ovary long enough, it could die and have to be surgically removed. One known cause of ovarian torsion is hyperstimulation, which means OHSS could lead to ovarian torsion in some women. The makers of Bravelle warned the drug could increase a person’s chance of developing blood clots. If a woman taking Bravelle developed OHSS, it could also significantly increase her chances of developing blood clots. How much did Bravelle cost? Fertility treatments can be expensive, and Bravelle was no exception. Depending on the dosage, one box of Bravelle containing five vials could have cost well over $500, making the cost-per-vial over $100. There was also no generic version of Bravelle available to drive down costs. Insurance companies often do not cover the cost of fertility treatments, so women are forced to pay out of pocket for their medications. Since fertility treatments often include the use of multiple medications at one time, the cost of treatment can add up quickly. Ferring Pharmaceuticals offered certain patients some relief when it came to the price of their prescriptions, providing discount programs to women who qualified. Yes, Bravelle has been recalled from the US market and is no longer available for purchase. Beginning in October 2015, the makers of Bravelle initiated a voluntary recall of more than 32,000 vials of its fertility drug. Citing a lack of efficacy, Ferring issued the class II recall for all vials purchased between March 27, 2014 and October 15, 2015. Ferring Pharmaceuticals said it initiated the recall based on company tests which showed 2014 batches of the drug were no longer potent after one year. That meant women hoping to become pregnant sought treatment with a drug that was ineffective. It also put women at undue risk of potentially serious side effects associated with fertility treatments. Will I be reimbursed for the recalled lots of Bravelle I purchased? Ferring Pharmaceuticals, the maker of Bravelle, is offering reimbursements for out-of-pocket costs associated with the recalled lots of its fertility drug. The company set up a reimbursement program for anyone who purchased the drug between March 27, 2014 and October 15, 2015 and took any remaining lots off the market. Which lot numbers were affected by the Bravelle recall? Are there lawsuits against the makers of Bravelle? Yes, there is at least one class action lawsuit filed against Ferring Pharmaceuticals regarding the recalled lots of Bravelle, and others will most likely be filed across the country. The class action lawsuit is currently filed in the U.S. District Court for the Eastern District of New York. The class action suit was filed in April by a Holtsville, New York couple, Angela and Daniel Lauruska, who say they spent between $20,000 and $30,000 for a round of in-vitro fertilization, which included a defective Bravelle injection. Filing a lawsuit could help women across the country recoup the cost of their failed Bravelle treatments, as well as expenses related to other fertility treatments. How do I file a Bravelle lawsuit? The lawyers at National Injury Help are currently investigating claims that Bravelle put women at an unnecessary risk for serious side effects by selling ineffective lots of its fertility drug. If you or someone you love used Bravelle purchase between March 27, 2014 and October 15, 2015, you may be entitled to compensation. Call National Injury Help today at 1-800-214-1010 for a free consultation, or use the form on the right-hand side of your screen.